Cast your mind back to Computex 2018 and you may recall Intel's not unsuccessful attempted to steal the headlines with their heavily reported Keynote. The centrepiece of said keynote was the unveiling and demonstration of a new 28-core Skylake-X CPU, overclocked to 5GHz and absolutely crushing the Cinebench R15 Multi-Core Performance charts. In the following days that demo was to be mired in controversy, but we're not here to retread past misadventures. 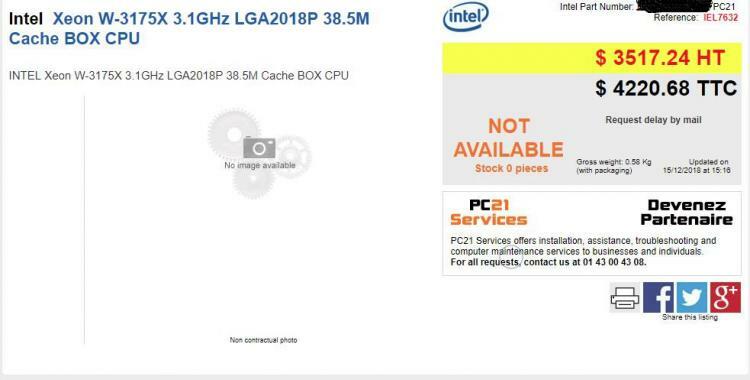 It's now over six months from that fateful unveiling and the CPU - known as the Intel Xeon W-3175X - has now started cropping up at some etailer pages, as laid out by Intel a few months ago. For now at least only pre-release/pre-order pricing is listed, set at an extremely premium ~$3,999, but that could very easily change. Although initially unveiled as a Skylake-X SKU, the design shares little in common with present Intel HEDT chips. Perhaps most significantly the design demands a server-class motherboard based on the Intel C621 chipset (potentially sold under new branding) and an LGA3547/LGA2018P socket, but you get an immense amount of horsepower despite (or perhaps because of) that restriction. 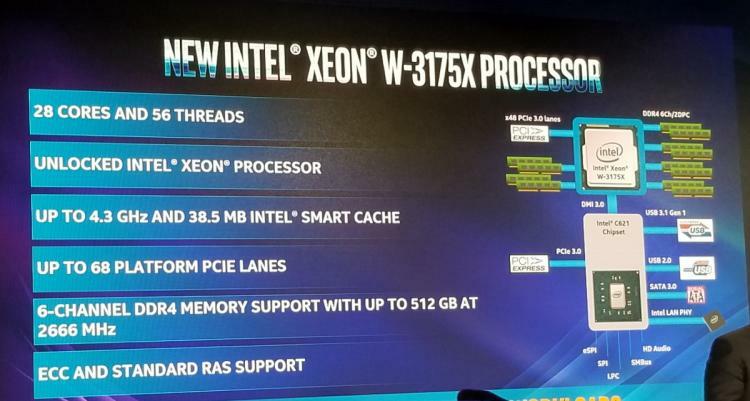 It remains to be seen how well the Xeon W-3175X will compare to AMD's flagship 32-core, 64-thread Threadripper CPU, its obvious competitor. And with AMD's EPYC Rome architecture set to debut in early 2019, one imagines the window for a successful launch is closing fast. And remember: if you want to get 5GHz out of this beast, you're likely to need some pretty exotic cooling.